- Rates shown are only applied for bookings with this system- The Evergreen Hotel is located in a quiet downtown section at the centre of Ho Chi Minh City, opposite a park and just 15 minutes from the airport. 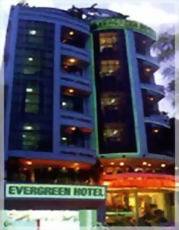 The hotel is very convenient for both the business and leisure traveller. - We offer international standard service for our guests and have 46 rooms equipped with private bathroom, air conditioning, IDD telephone, internet line, satellite television, refrigerator, hand-held hair-dryer and an electronic safe. Other hotel facilities include our fantastic restaurant, room service, meeting room and a car rental service. We accept Visa and Master card. - The five different types of rooms we offer are standard, economy, superior, deluxe and junior suites. - Private bathroom, aircondition, internet line, satellite television, big room with kitchen.